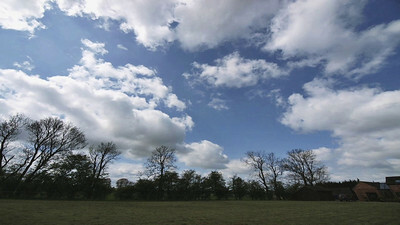 A selection of my time lapse sequences. Sky in stunning motion. 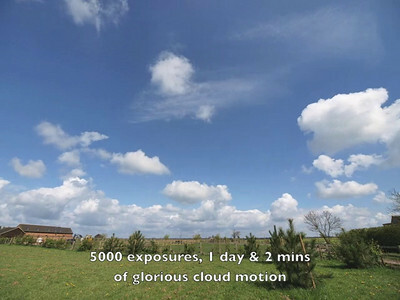 There is no better way of seeing how the atmosphere works through all of its layers than by studying time lapse of the sky in motion. Try to imagine the air above us as a piece of cake with many layers. Each layer represents wind moving, at different heights and at different speeds. This is called wind shear. 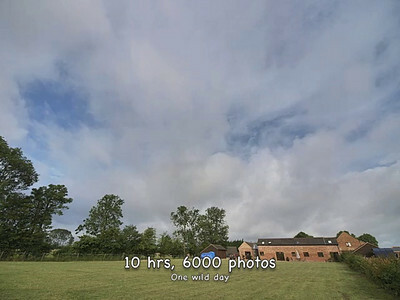 Very difficult to see at any single moment in time, however by capturing many hours worth of digital stills with a good quality digital camera, adding them together in sequence then you have a period of time lapse which shows the full spectacle. June 14/15th 2010. 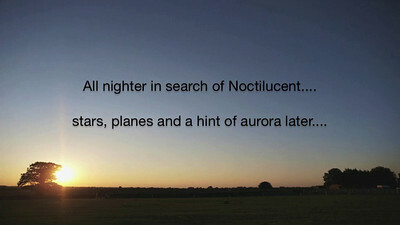 Sightings of Noctilucent coming in over various parts of UK now. Unfortunately cloud has all but killed my current attempts. At last and albeit a glimpse towards the end of the video, near sunrise (approx 0300hrs), and my first successful capture of 2010. Watch very carefully towards the end or you might just miss it. Hopefully the start of may more sightings. Olympus E3, 12-60mm lens. Approx 1800hrs - 0310hrs and 3510 exposures. June 13 2010. What started as a very quiet day slowly built with convection as the unstable trough passed through late afternoon. By the end of the day we were right inside the low pressure system. All in all some great cloud layer movement and wind shear. The camera also got a complete soaking, as you will see. Camera viewing started south west, switching to south east and finally back to south west. 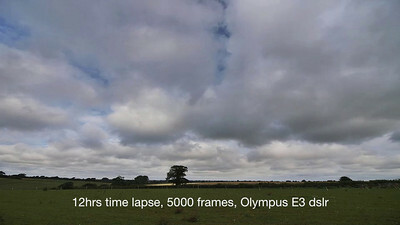 Olympus E3, 7-14mm lens. Approx 1130hrs - 2130 hrs and over 4000 exposures. With Noctilucent starting to make minor appearances I take any clear sky evening opportunity to time lapse the event. 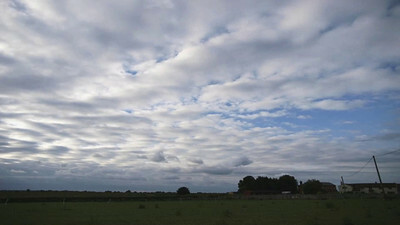 The evening of the 11th June 2010 started off clear but as darkness beckoned so did the cloud cover. It makes for a spooky time lapse mind. Over 4000 images taken from sunset on 11th till sunrise on 12th. Olympus E3, 12-60mm. 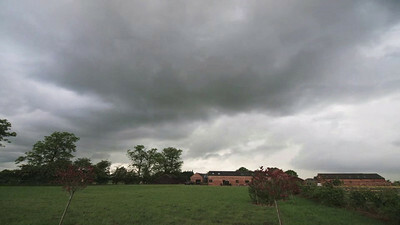 June 8 2010 Storm time lapse. Inside the washing machine. My location was perfect today for time lapsing the convective storms. Many funnel clouds and tornadoes were reported close by. When you see this video you'll see why. It was wild up there in the lower layers. Veering wind flow around the LP made for some stunning cloud madness. Enjoy. Captured with Olympus E3, 7-14mm lens and which got drenched for this shoot. 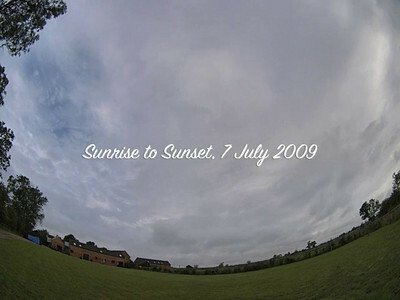 All night time lapse from sunset of 3 June through to sunrise 04 June 2010. In search of the first Noctilucent of the 2010 season. Quite surprised with the catch - A setting sun, stars, plane trails and even a hint of aurora (Geomagnetic storm KP 5) and not bad to see that from Leics skies albeit very faint. Captured with Olympus E3, 12-60mm lens and 4000 images. F2.8, ISO 250 and varying shutter times (max 6s in dark). May 30 2010. 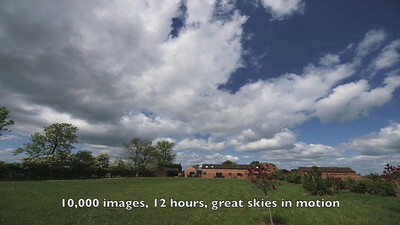 12 hours of cracking sky time lapse. 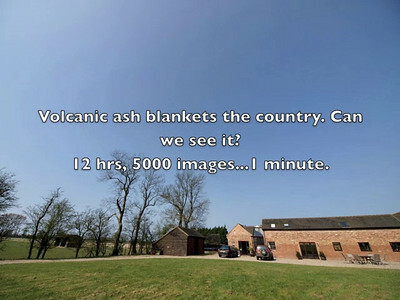 10,000 images over 12 hours. Some great cu fields and convection especially towards the end and watch out for the sun halo :-) East/North easterly flow. Captured with Olympus E3, 7-14mm. May 28 2010. 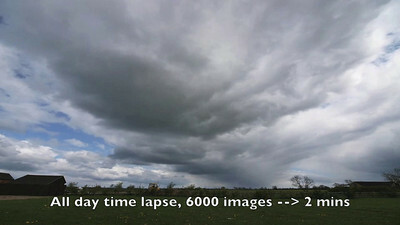 Very cool time sky lapse from 0700 -2200hrs. A whopping 10,000 + images from the 15 hour day. Some great cu fields flying towards the camera. Watch them spawn and die. Wonderful. Captured with Olympus E3, 7-14mm. May 16 2010. 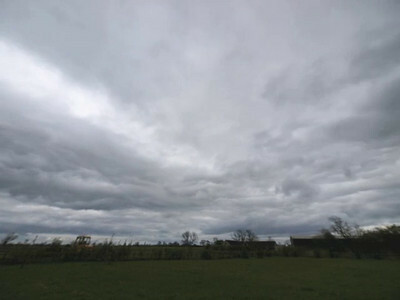 Some great linear cloud motion in this time lapse with evident wind shear towards the end of the day. 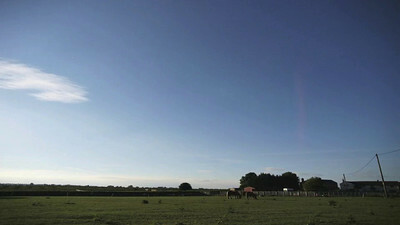 May 11 2010 time lapse. Spring northerlies still biting. 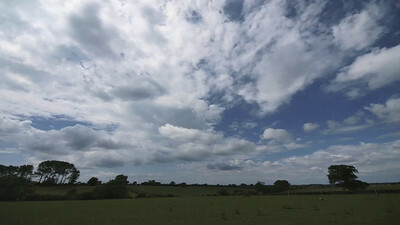 Love the rolling Cu and some nice turbulence towards the end of the vid. Another great Spring day for some time lapse action. 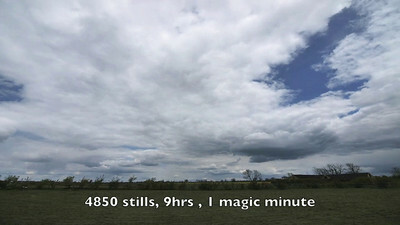 Camera out at 0900hrs and running exposures till sunset approx 2030hrs. Some 6000 exposures in total and all run and output to a movie file. 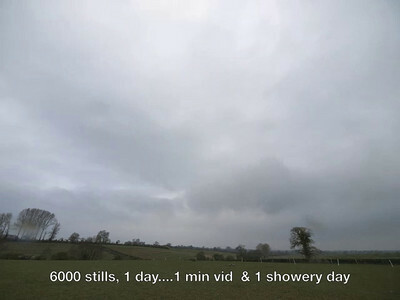 Some cracking convective power shower footage and shelf cloud towards the end of the movie. 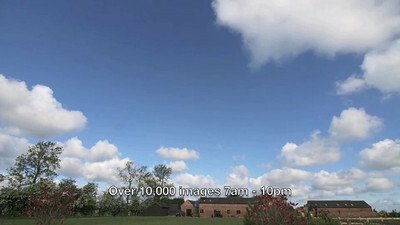 All stills captured with Olympus E3, 7-14mm lens & using the PClix time lapse controller. April 24 2010. UK airspace back to normal. Milky skies, uni-drectional flow and plenty of contrails, probably bringing many relieved passengers back home! April 03 2010. 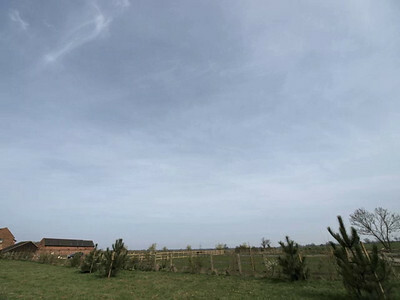 Unsettled Spring conditions are creeping back in from winter's door. 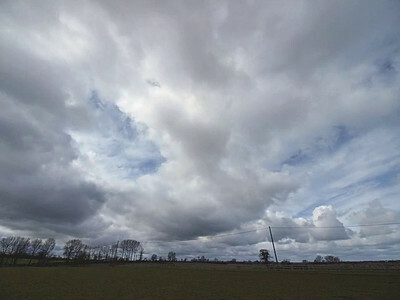 Convective conditions, bubbling cumulus and weather fronts all appear in this scene. July 06 2009 Storms. What a great day this was for time lapse. Lots of rolling fronts, convection and precipitation. 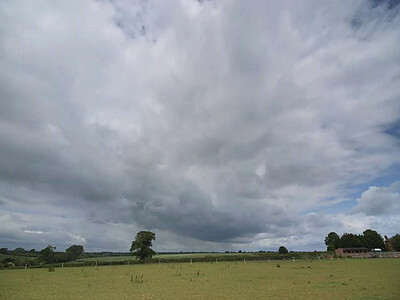 June 20 2009 time lapse. Full day's worth. July 24 2009. Power Showers Time Lapse. July 07 2009. Great time lapse from a fisheye perspective. Lots of rolling convective clouds, precipitation and fronts with some great wind shear too. Especially the accelerating bands of precip towards the end. 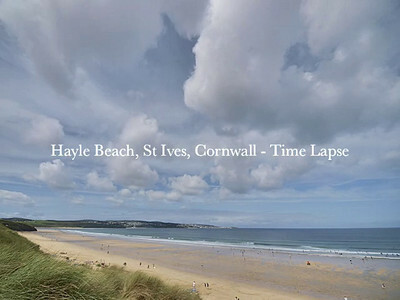 Whilst taking a few days break in glorious Cornwall I took the opportunity of capturing some coastal time lapse action. The tidal movement adds to to some great wind shear and cloud motion.